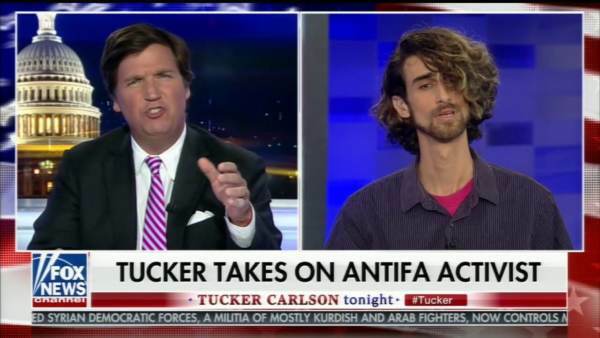 Tucker Carlson believes that one of the members of the Antifa mob that harassed his wife at home last night was once on his show. The protest appears to have been organized by Smash Racism DC, an Antifa group that was co-founded by Mike Isaacson — who previously appeared on Tucker Carlson Tonight. Carlson stated that he can’t prove that the person he is thinking of was involved, but that they are going to find out. “If you have something to say, you’re always welcome to come back on and say it. Again, he doesn’t want to say it — he doesn’t want to convince you — he wants to scare you into shutting up,” Carlson said. Carlson added that this wasn’t a protest — it was a threat. Along with pounding on his door and screaming threats, the group also spray painted an anarchy symbol on Carlson’s driveway. Isaacson was fired from his job at John Jay College after Twitter posts were uncovered in which he celebrated violence against police and called for the assassination of Vice President Mike Pence. He became a viral meme in the days after his appearance on the show. Isaacson claims that he is no longer involved with the group, but supports the harassment. Two sources told Gateway Pundit that Isaacson has become unwelcome in activist circles over his behavior — particularly with women — and they believe that it is unlikely that he was in attendance. On Thursday evening, the DC police visited the home of at least one known Antifa activist. No arrest was made. The incident is currently being investigated as a hate crime. Dear friends, MPD came to my house just now asking about last nights protest. Hours after the incident at Carlson’s home, the addresses of Carlson, his brother Buckley Carlson, the Daily Caller’s Neil Patel, Sean Hannity and Ann Coulter were posted on another DC Antifa account.